Thilafushi was originally a lagoon called ‘Thilafalhu’, with a length of 7 km and a width of 200 metres at the shallowest regions, situated a few kilometers from Male’. Reclamation of Thilafalhu started on 7 January 1992, in order to solve the problem of garbage generated in Male’. Thilafushi waste disposal centre was initially started as the main waste disposal centre for Male’. Presently waste from nearby atolls and resorts are also disposed there. Thilafushi lagoon fill, with used batteries, asbestos, lead and other potentially hazardous waste mixed with the municipal solid wastes, is an increasingly serious ecological and health problem in the Maldives. Even though batteries and e-waste are quite a small fraction of municipal waste disposed at the Thilafushi, they are a concerted source of toxic heavy metals such as mercury, lead and cadmium. Chemicals can leach out into water table or sea and endanger the surrounding sea and reefs. 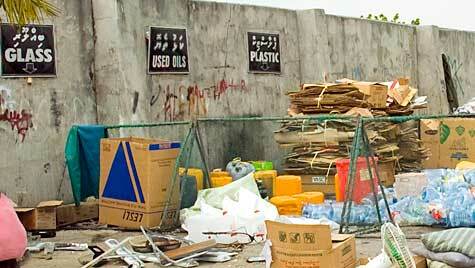 Potentially hazardous wastes are not sorted at the collection or disposal ends in Thilafushi. However, nowadays at the disposal site at Thilafushi and in the main collection centre in Male, scrap metals such as copper, tin, zinc, steel, plastic bottle, cardboard boxes and used oil are sorted. According to the Custom Statistics scrap metal is the major export from Maldives to India. There are no recycling facilities for the safe disposal for the hazardous waste such as used batteries, lead, asbestos and mercury in the Maldives. Asbestos are mainly found in the Maldives as corrugated asbestos-cement sheets or “A/C Sheets” locally know as Simenthi tinu (Cement roofing sheets). A growing number of mobile phone and electronic equipment purchases in the country and rising number of tourist arrivals in the recent decades lead to an increase in disposal of used batteries and other potentially harmful electronic or e-waste. These are mixed with municipal waste and are inappropriately disposed in the Maldives. Likewise, e-waste with other hazardous waste such as mercury, lead and cadmium in the used batteries can mix in the salt water at Thilafushi dump and cause even more danger. The scariest part is that unlike the landfill, in a lagoon fill or sea fill, toxics chemicals can easily seep out into the coastal zone and enter into the lower level in the food web, algae, zooplankton, and fish. Once these toxics chemicals are released it is very difficult to remove them from the food web and can end up on our dinner plate in fish or lobsters. its a gud article. these r the type of articles mostly be wanted to publish for the awareness of the people. Theres a quite popular dive site near that area which already is seeing adverse effects of Thilafushi …ask any diver who has been there…and seeping chemicals is a problem that any fifth grader would identify as a problem!!! i think this article is poor, because no recomendation was give to the problem. 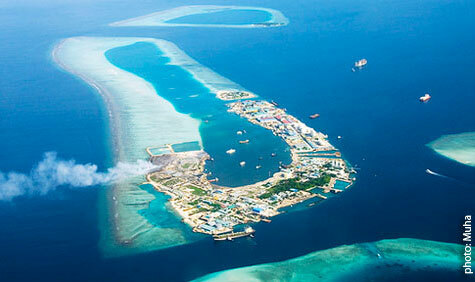 Problems of waste disposal in the Maldivian islands struck me as soon as I landed in Maldives in 1999. On remote islands, I have seen dumps of domestic garabage, condemed metallic house wares, even cars and trucks inside the lagoon. All these must have been leaching and releasing heavy metals for a long time and had their access into to the human food chain. When I was on Sh-Komandoo island (1999-2001), I used to mention about the dangers of having such things in the water around the island to my students but the people do not really realize it easily. I have never noticed anybody from the administration bothering about the same either. Its good to know that problems of heavy metal contamination is being brought to the limelight. As far as I understand from my research background on heavy metal contamination in marine environment is that a concrete plan for disposal of such hazardous wastes in Maldives is an issue requiring immediate attention, because the local people use the reef fish and other organisms as their food. Heavy metal transfer through such food is very fast and could show its effect in generations to come. Organisms which are resident within the reef and are not migrating on and off to the sea are the ones which will be having loads of metals in their body tissues. Livers, fatty tissues and barin are the parts where such heavy metals get preferentially deposited. Unfortunately in Maldives these body parts are delicacies. Fishes like groupers, travelly jack (Handi) and snappers are unfortunately very much prone to have these heavy metals in their tissues. A real time EIA must be conducted ASAP to ascertain the risk due to heavy metals in the Maldivian waters so that the people, (present generation and the future generation) could be assured heavy metal contamination risk free environmental resources. Hi.just wanted to comment that its a great article and it is so refreshing to see this type of informative articles on this website.even though you have not provided a solution for this major envioronmental problem, i feel by writing this type of articles benefit not only this site but also all maldivian nationals because the case has been brought to the attention of the government and it is the government which has to explore this problem ,research immediately and find the solutions. look forward to more articles like these in future. Good that this has been brought into attention of common people, i suggest this article to be converted into Dhivehi and publish on a daily paper. This kind of environmental problems are many in the Maldives. Giving green leafs to resort owners wouldn’t help much to protect our environment unless we give good care to our environment. If my information is not wrong in 90,s, MoH went on carrying out water quality tests around Thilafushi, they used to test BOD, COD and other few parameters in every six months. wonder whether government is doing any such testings on the water around the island and where those reports might be?? Well, without doing proper studies on the likely impact of lagoon filling the Thilafushi has been reclaimed. We need to undertake a detailed study on the environmental impact of this land filling which is still ongoing. As others have commented that, even a trace element of heavy metal could cause sever impact to the food chain. The dangers of this kind of land filling without proper measures would be that the trace elements of heavy metal leached into the water will be directly affected to fish community especially reef fish ( Maldivians Heavily depend on). When we eat these contaminated fishes keeps on accumulating heavy metals (trace level) such as Mercury, Lead etc. in our body tissue, leading us into Heath Risk. WE need Urgent action on this. Thanks Bluepeace. the artice is good. but, You have not provided a solution for this major envioronmental problem. still we face a garbage problem. Sowe have to use these garbage fore economical use. then it gain from lot of ways. Certainly its the most pollution creating resource of the entire region around the central Maldives.The garbages collected on the island are washed away in the high tides and during other abnormal tidal surges as thilafushi was reclaimed very low level. Anyone could find those garbages floating inside and outside of the lagoon during high tides in a daily basis and it is now a complete hazard to all Navigators now,specially to high speed navigation. the waste disposal unit at thilafushi. Some years ago, a proposal was submitted to the Minister in charge of Thilafushi Mr Umar Zahir to install a very big incinerator at that island at no cost to the government. However, since Mr Umar Zahir did not have the faintest idea what an incinerator could do, he refused to accept the whole thing. Bluepeace strongly feels the solution to the issue of Hazardous Waste can only be addressed within a National Framework for Solid Waste Management in the Maldives. There are a number of studies by different organizations on Solid Waste Disposal for the Maldives, including hazardous waste. Most of the studies have gathered dust on bookshelves. We would like to hear the perspectives of concerned citizens about the issue. When $10.3-million has spent by the Canadian and Australian Red Cross under a joint venture to dispose tsunami related sold waste in the Maldives. They even have left hazardous waste in plastic containers in Tsunami affected islands and in even in Thilafushi without providing technologies for the safe disposal. Under this joint venture in 74 islands waste management centers have been built. It has no management, most islands none is paid to manage these centers. Hinnavaru people have reported that the Waste Collection Center built by Red Cross in the island has never been used and it is kept locked and closed by the island administration. As a result the people are dumping garbage all over the island. ހިންނަވަރުގެ ރައްޔިތުން މައުލޫމާތު ދޭގޮތުގައި ރެޑް ކްރޮސްގެ ފަރާތުން ހިންނަވަރުގައި ހަދާފައި ހުންނަ ކުނި ކޮށީގެ ބޭނުން ރައްޔިތުންނަކަށް ނުކުރެވެއެވެ. މިތަން ހުންނަނީ ރަށު އޮފީހުން ތަޅު އަޅުވާ ބަންދުކޮށްފައެވެ. ދެން މީހުން ކުނި އުކާލަނީ ރަށުގެ އެތަންމިތަނަށެވެ. According to the Environment Research Centre the completion of the Tsunami Debris and Waste Management Project initiated by the Australian Red Cross (ARC) and the Canadian Red Cross (CRC), a ceremony was held on 4th July 2007. If this project is over why on earth hazadiuos waste,such battaries collected in plastic bins still in tsunamis affacted islands in Baa Atoll and other islands. What they have done with 10 million US, these Waste Collection centres in the islands would not cost even US15,000. 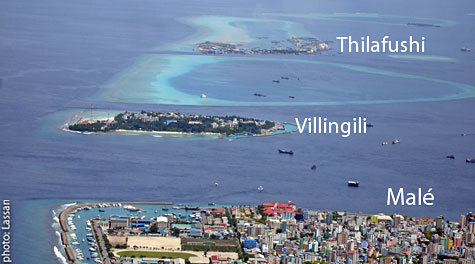 Let me tell you the story of Thilafushi. Former Minister of Construction and Public Works Umar Zahir was the mastermind behind this project. After reclaiming the lagoon from waste, Umar Zahir was personally profiting from the island because he and his associates took bribes for leasing land for industrial purposes in Thilafushi. When you talk about the lagoon fill Thilafushi, you should talk not only about it being a toxic bomb in the ocean, but about the deep-rooted corruption associated with it. No wonder there is no mechanism for managing hazardous waste there. The island was meant to be a business venture. some of these funding organizations, in the reconstruction and recovery programs after the deadly tsunami hit, in Maldives didn’t work to provide sustainable infrastructure, instead they tried to put up something which you can see and take photographs which they can present their tax payers in those rich countries. tax papers of those rich countries would think that they have contributed to build up poor Maldivians homes, sewerage systems, solid waste disposal facilities, roads, harbors etc. Thilafushi is a perfect spot for having a ‘toxic tour’. Read this wonderful article about how environmental justice activists are providing viable solutions and redefining how society could deal with environmental issues such as hazardous waste, loss of greenery, and landfills. The article is great except that the writer has missed out points like the clouds of smoke, the flies and the smell which sometimes reach the capital Male’. Also its worth to note the instability of the land in which most of our industrious buildings are erected. In some areas of the Island, you can actually feel the heavy vibration when a vehicle moves. As I quote “Presently waste from nearby atolls and resorts are also disposed there”. “A growing number of mobile phone and electronic equipment purchases in the country and rising number of tourist arrivals in the recent decades lead to an increase in disposal of used batteries and other potentially harmful electronic or e-waste”. This clearly indicates that the tourism sector is responsible for some of the wastes accumulated in Thilafushi. One solution to the problem could be charging the resorts for their waste (this will pressure the resorts to minimise their waste generation). The money generated from this way can be used to export chemical related waste to other countries. One other solution could be to provide “bins” to households for different wastes and to create a mechanism to collect them. This can be achieved! For example, the Maldives government has distributed “2500L drinking water tanks” to almost all the households in all the islands. Of cause this is achieved through various sponsors and agencies. The only thing we need to do is, just realise how important it is to have a proper waste management system. The government needs to act on this before it’s too late! I am deeply concerned over this issue of environment, especially from a country like Maldives where its President who claims to be a Champion of Environment by strongly advocating in favor of Environmental Activists in the international arena. I think this issue will become more prevalent as time goes on. This isn’t a country issue, this is a global one. Our current consumption levels will not allow us to sustain the environment. This conversation needs to be had sooner rather than later, before its too late.